Florida citrus growers have begun taking notice of kaolin clay, a powdery white compound, because it can cause Asian citrus psyllids (ACP) to “not take notice” of their groves. Long used to protect other fruit and vegetable crops, kaolin can also conceal citrus trees from hungry psyllids by confusing their visual sensory system, said Michael Rogers, director of the Citrus Research and Education Center in Lake Alfred, part of the University of Florida Institute of Food and Agricultural Sciences (UF/IFAS). Consequently, kaolin has emerged as a viable weapon in the battle against the bacterial disease huanglongbing, also known as HLB or citrus greening disease. 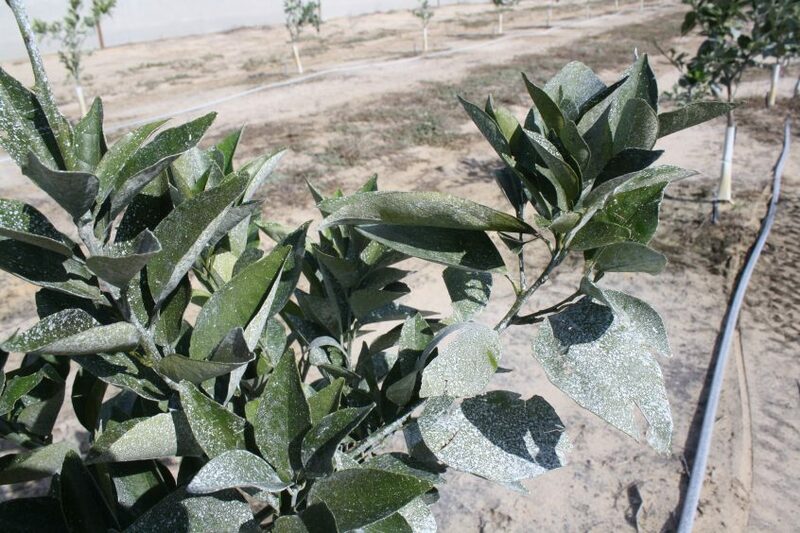 Chief among those benefits is the fact that kaolin can “hide” citrus trees from the ACP, the insect that transmits the pathogen responsible for causing HLB, Vincent said. The psyllid feeds on citrus foliage and new growth, and finds host trees by using its visual system to search for the wavelengths of light that people perceive as green or yellow. But a coating of white kaolin can mask the leaf canopy so much that psyllids don’t recognize it as citrus foliage, he said. Currently available kaolin products are colored white. But as part of the overall project, Vincent’s team is evaluating a red-colored kaolin developed at UF by an interdisciplinary team that included Michael Rogers. Though not yet sold commercially, the red kaolin is available for licensing from UF. When mixed with water and applied to trees, it temporarily imparts a pink color to treated areas.